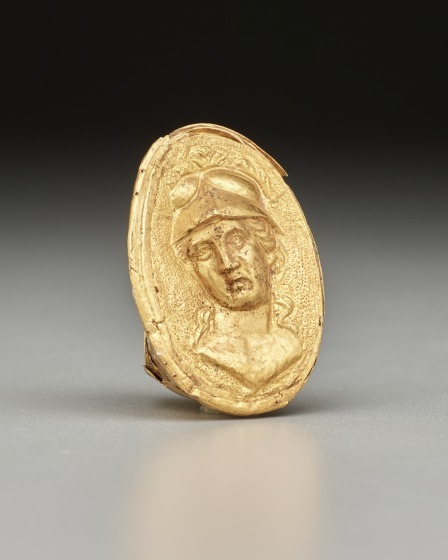 Simple rings made from sheet gold or gold wire occur in Greek graves dating to the 10th century BCE., and there is consistant evidence that simple gold bands were worn as rings in the following centuries. As a result of Egyptian or Phoenician influence, more elaborate forms slowly became popular beginning in the 6th century BCE. The 3rd to 1st centuries BCE. saw an abundance of rings and a large variety in shape and style. 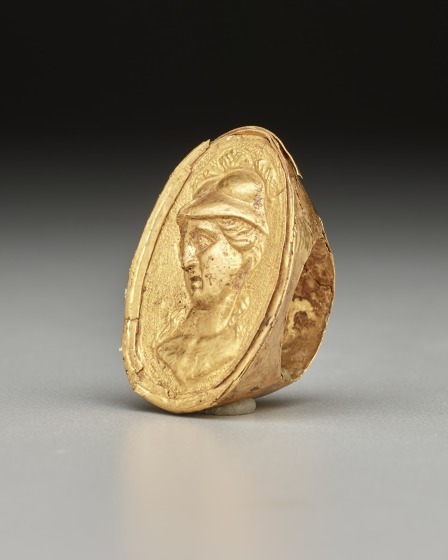 An exceptional piece is this large gold ring featuring a relief bust that echoes the famous statue of Athena created by the sculptor Phidias for the Parthenon. The hollow hoop of this ring, rounded outside and flattened inside, meets the large oval bezel at a sharp angle. 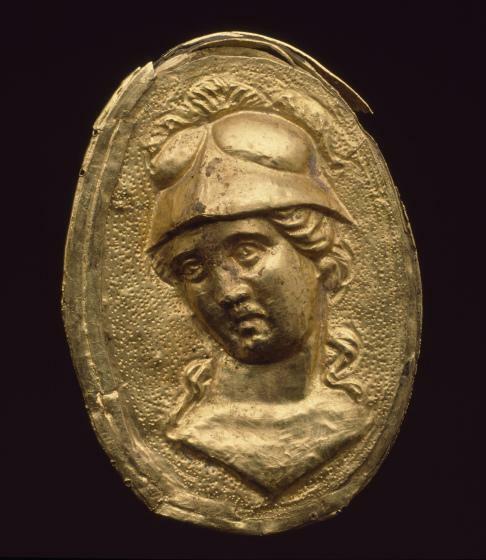 The flat bezel is inlaid with a separately made oval relief plaque displaying the bust of a helmeted Athena, in three-quarter view against a stippled background. The softly rounded features, the loosely pulled-back hair, and the gentle, dreamy facial expression contrast with the bellicose attire of a triple-crested helmet, from which two strands of hair escape to rest on the shoulders. 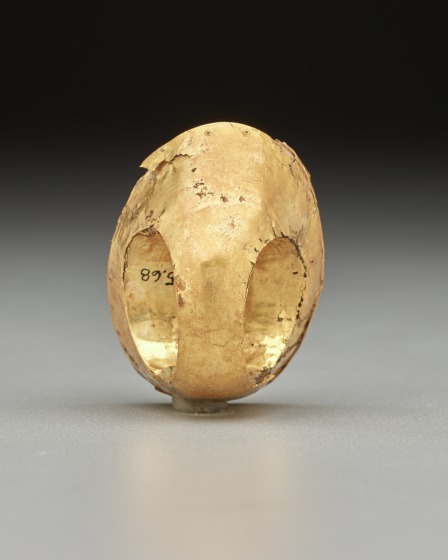 The ring dates to the 3rd century BCE, a period during which extremely large rings of this shape and decoration seem to have been a status symbol. 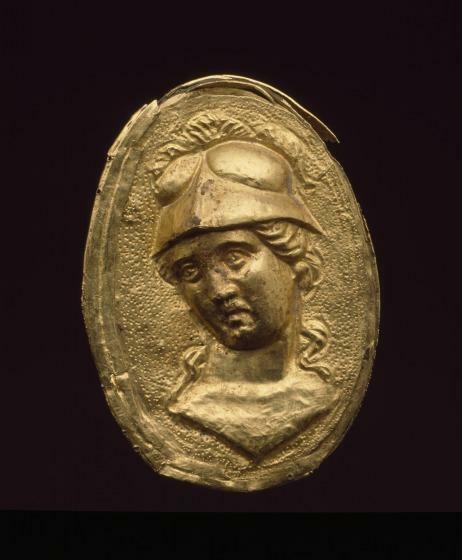 Closely related examples have been found in south Italy and in the Greek settlements on the northern shore of the Black Sea. 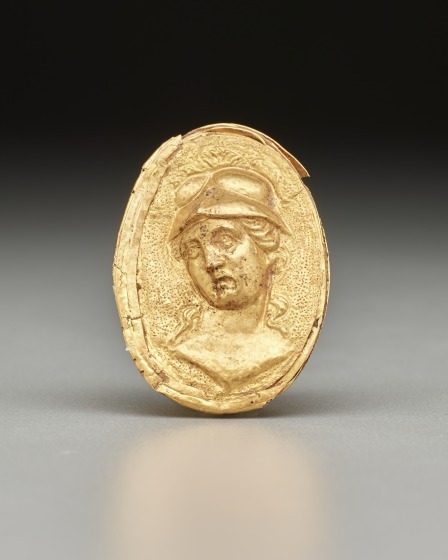 Barbara Deppert-Lippitz, Ancient Gold Jewelry at the Dallas Museum of Art (Dallas: Dallas Museum of Art in association with the University of Washington Press, 1996), 66; 139.